Chalk Talk: A Kindergarten Blog: More Than Just "Sound it Out"
I have learned so much about teaching reading from Kimberly Gillow of Funky First Grade Fun and what I learned from her inspired me to read books about teaching reading all summer long. Recently Kimberly asked me to do a guest post on her blog and I was honored. If you feel like you overuse the phrase "sound it out" with your little ones and you want to know more about other beginning prompts for young readers check out my guest post here. 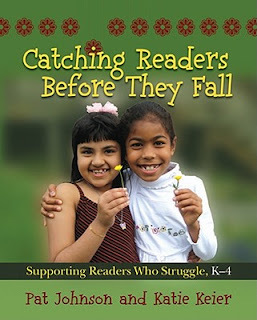 It is based on the book Catching Readers Before They Fall. I highly recommend this book to anyone who teaches reading. Thank you so much for doing a guest post on my blog! Your kind words mean a lot to me. So glad we could connect and work together!